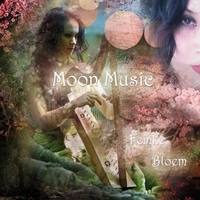 Inspired by the Silver Circle Moon Calendar Femke has composed 13 different songs for all the moons – including the once-every-3-years Icemoon – beginning with “The Long Night Moon”. Complete with a description** of each moon we are taken through the whole year. Some of the tracks are purely instrumental whilst a number are accompanied by Femke singing. It is however not necessary to wait for a specific moon to enjoy Femke’s harp playing. This is an ideal musical accompaniment to the moon pathworkings but also a welcome addition to those who like pure and unadulterated harp music. Oh yes, nearly forgot – there is an additional track called “Dragon’s Cave” which is quite different but equally haunting.